"Margaret Leonard and the other conspiracy defendants were part and parcel of a conspiracy to defraud Dallas County Schools and its taxpayers through a complicated scheme of bribes and kickbacks to Dallas and Texas politicians, some of whom who have pled guilty to federal charges arising out of the same conspiracy," attorney Christopher L. Harbin wrote in court briefs. Harbin represents the committee that formed last year to shut down DCS and sue the perpetrators at Force Multiplier Solutions (now operating as BusPatrol) along with anyone else who assisted the kickback scheme. Force Multiplier CEO Robert Leonard was the mastermind behind the bribery plot, but the committee also wants to go after Margaret Leonard's assets because of her apparent involvement. Checks in her name were written to DCS president Larry Duncan, who admitted taking bribes. She gave $5000 to state Representative Ramon Romero (D-Fort Worth), $7000 to California secretary of state Alex Padilla (D) and $5000 to Louisiana governor John Bel Edwards (D). In an April 6, 2015, email, Duncan told Robert Leonard how much campaign cash was expected in each Dallas city council race. Linda Leonard's signature is on $1000 checks for each name listed. 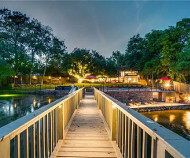 Even though Margaret Leonard did not work for Force Multiplier, the company paid the mortgage on her $1.6 million "resort like estate" on Royal Lane in Dallas (pictured). She also received over $50,000 in payments from the company over two months. Shortly after Margaret Leonard filed for divorce on November 8, 2017, many of Robert Leonard's assets were transferred into her name. Harbin argued the divorce was a ploy to shield those assets. "I didn't write this check," Margaret Leonard explained in a deposition earlier this month. "That's not my handwriting." The primary purpose of Dallas County Schools was operating the school bus service, but it decided to pay $25 million to Force Multiplier for the exclusive right to market and sell school bus cameras to other Texas school districts. The scheme failed to make the promised return, and debt spiraled out of control. DCS and Leonard cooked up a complicated real estate deal to raise funds, which only drove DCS deeper in debt. Investigative journalists at KXAS-TV exposed the plot after noticing the campaign cash flowing from Force Multiplier to camera boosters on the council. ^ - Orange prison jump suits become her !